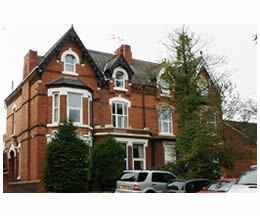 Safeharbour, 254 Hagley Road, Pedmore, Stourbridge is a large Victorian semi-detached property set back from Hagley Road, in a residential area of Stourbridge approximately one mile from the town centre. Stourbridge is part of Dudley Metropolitan Borough which offers a large range of facilities and amenities in the surrounding area. (Any other amenities required are resourced from nearby Birmingham and Wolverhampton). The house has seven bedrooms, three ground floor and four first floor rooms. All bedrooms have the pipework for ensuite facilities (should this meet the service user needs). There are two large bathrooms (one on the ground floor and one on the first floor) and a shower room. Safeharbour 254 Hagley Road has two large lounges, with furnishings and entertainment facilities, as well as extra areas for dining, a dining room and a spacious kitchen on the ground floor. To access the first floor, there is a stairway from the main hall and another to the rear of the property near the back door. Both staircases lead to four bedrooms, shower room, sensory room and large bathroom. Safeharbour has a gravelled car park to the front of the property with tarmac leading to a large wooden gate. This provides privacy to service users when they use the garden to the side and rear of the house. Safeharbour has a gravelled area to the rear of the property, It is a walled garden with bushes and trees. There is a trampoline for service users to play on, tables and chairs and a large wooden shed. Safeharbour can accommodate seven people. All bedrooms presented are fourteen square metres or over (see house map). Each bedroom is for single occupation. This conforms to the standards laid down in the Health and Social Care Act 2008. Each bedroom has a bed (double or single as the service user chooses or needs), bedding and bed linen, appropriate storage for possessions and clothes, suitable lighting, comfortable seating for two and a lockable storage space. This follows requirements set out in the Health and Social Care Act 2008. Service users have the opportunity to decorate and personalise their own rooms to their own requirement. Safeharbour understands that the service users may have special needs with regards to their personal accommodation. Management and key workers will risk assess their environment and meet physical requirements through appropriate environmental changes. This will be documented in their Person Centred Plan.